Above: Dressed for the Apokries Carnavale with my brother, Efstratios. Above Right: With friends and celebrating the Apokries Carnavale. 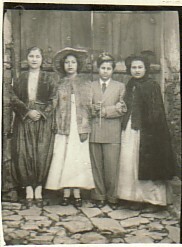 L-R: Tasoula, unknown, Maria and me. 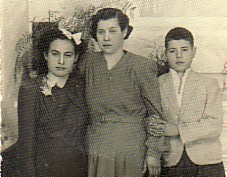 Above: With my mother, Evangelia, and my brother, Efstratios. This photograph was taken when we were preparing to migrate to Australia. 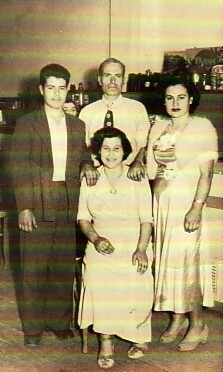 Above Right: The Papantoniou family- with my parents, Vlasis and Evangelia, and my brother, Efstratios. 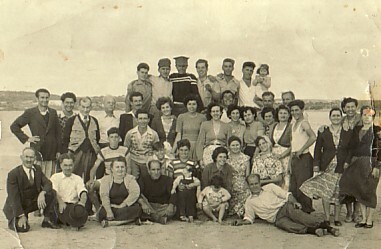 Above: Picnic at Geralton, Western Australia, with other Greeks of the town. My mother, Evangelia, and I are sixth and seventh from the right in the second row. My brother, Efstratios, is in the top row, first from the left. 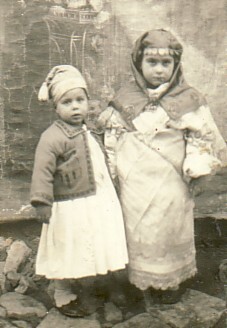 Above: With my children, Mihail and Areti (Rita).